And your host tonight will be Clyde! Ever in search of awesome BBQ, we’ve been thrilled and let down in some way at all the BBQ spots that we’ve been to. One spot has good ribs, but everything else is “meh.” One place has great sides, but the meat is just okay. To date, our top spot nearby has been Q in Port Chester, NY–a former haunt of ours back in the day when we lived in Rye Brook, but we’re always on the search for BBQ utopia. So, when we were at the Italian Center in Stamford for a charity event earlier this year and heard about another BBQ champ, Bobby Q’s Bodacious BBQ & Grill, we knew we had to get there asap. I know, I know, it might have taken us five months, but we finally got there. First, when you walk in, you realize how freaking cool this place is. 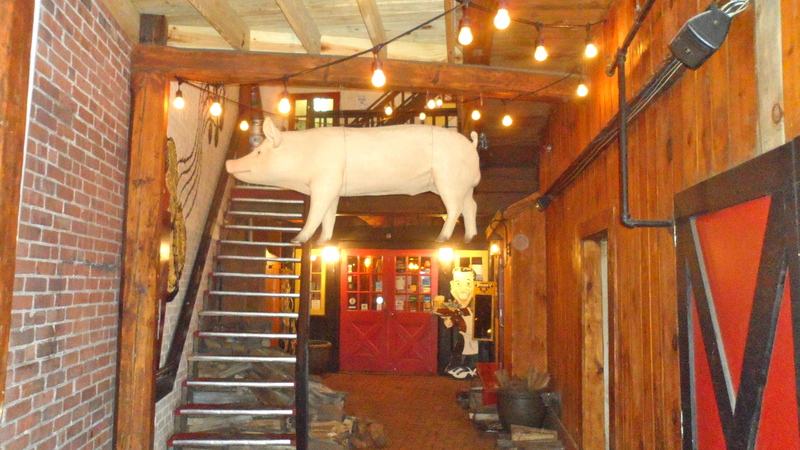 There’s a walkway leading you to BBQ heaven with Clyde, a giant hanging pig, beckoning you forward. You can go upstairs to their beer garden and patio where there’s live music or go straight ahead to the restaurant. You definitely get that cool, down home, BBQ-kinda vibe going on here. There was a bit of a wait, but what do you expect when Bobby Q’s gets awards, year after year? Well, it was worth the wait. The menu is really huge and can be overwhelming if you don’t have any ideas in your head about what you want. You’ve got classic BBQ items, grilled specialties, salads, sandwiches, wraps and of course a plethora of sides. Not really sure what to order, I decided I’d try everything and go for the gold: The Pitmaster Platter challenge. If you finish pulled pork, brisket, smoked turkey, two bbq sausage links, St. Louis ribs, and two sides you’ll get bragging rights and a t-shirt. In my head I had visions of victory, of taking down the food and of making Adam Richman proud. Yeah, well, um. Here’s a recap of what we ate and what we thought. 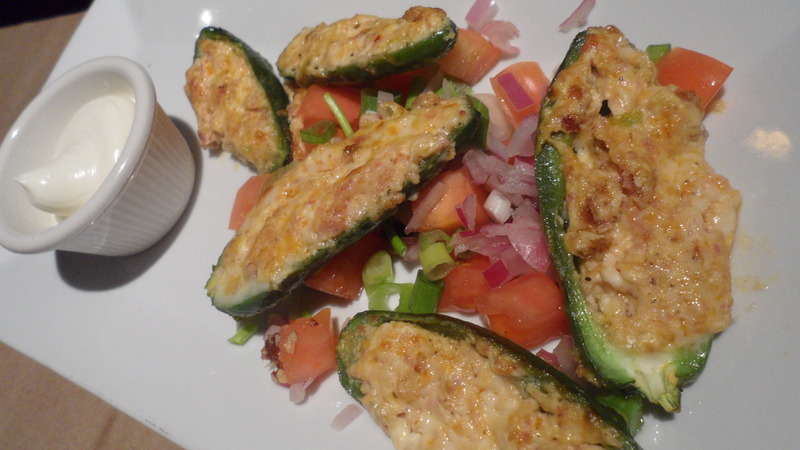 Baked (that’s right, not fried) Jalapeños stuffed with BBQ sausage, onions, secret seasonings, pepper jack, and cream cheese. Kristien couldn’t get enough of the cream cheesiness mixed with the soft, slightly spicy pepper and nice chunks of sausage. She loved the lightness of it compared to the typical fried kind. She declared all “poppers” should be baked, not fried. The pulled pork was moist, flavorful, and just plain excellent. I’m sheepish about getting pulled pork because I find that most joints overcook it or drown it in sauce. Neither was the case here, though Kristien thought it was a bit dry. Smokey Joe’s in Stamford has always been our favorite brisket, but Bobby Q’s is now right there with it. First of all, slathered in a vinegary tart sauce that complimented the meat well. The brisket had that lovely pink smoke ring that imparts flavor and keeps the meat nice and juicy. This was a real melt-in-your-mouth treat. Not usually a favorite of ours because BBQ joints tend to dry it out. These slices were nice and juicy and were bangin’ with smoky flavor. Some of the best smoked turkey I’ve had. Every BBQ seems to have a different kind of sausage on the menu. Bobby Q’s is more of a kilbesa style. The great thing about good sausage is a crispy skin, so when you bite down it makes that classic pop. Yeah, this had it. Good flavor, good bite. Kristien and I don’t usually enjoy dry rubbed ribs. We like our saucy ribs…so saucy that you need 30 napkins just to clean off one hand. Bobby Q’s does have you covered, though, in this case because there are three sauces at the table for you to freely use. If you like them enough, you can buy them, too. The ribs were cooked nicely with a beautiful pink ring surrounding the ribs. That’s the mark of a master BBQ chef: the smoke ring. Smoky taste with nice chunks of bacon. This helped to cut into the meat wall that I was trying to break through. Huh uh, I said meat wall. Good beans. I was stuck in a tight situation. I don’t like many typical BBQ sides (I detest coleslaw, for example), so I went with fries. They came out nice and hot and were crispy. Nice fries that also helped me to cut into the deep flavors and protein that I was ingesting in obscene amounts. Kristien is a Coleslaw snob. Seriously, she’s ridiculously picky about it. She said this one was nice and fresh with big chunks, but she didn’t love it. Too much mayo without enough seasonings was her reason. Hey, she knows good coleslaw when she eats it. Kristien loved this style of Mac & Cheese because it reminded her of Kraft…super creamy & cheesy with that down home, comfort feeling it brings you. Yep, you now know her guilty junkfood pleasure, Kraft Mac N Cheese. As valiant as I fought, I could not break through the meat wall. I surrendered in defeat, taking home scraps for the puppy. He enjoyed Bobby Q’s also! All around, it’s clear to see why Bobby Q’s wins award after award and is always packed. Great food, cool atmosphere, excellent drinks, and real bbq finesse. This might be the first time that “BBQ” and “finesse” were used next to each other, but it’s true. 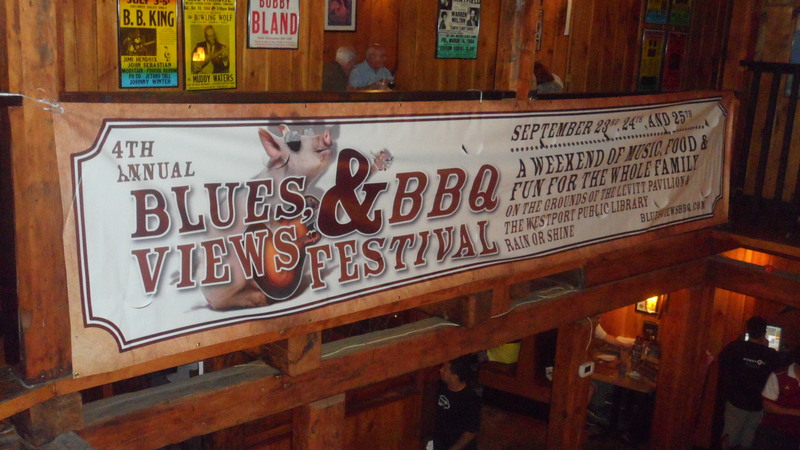 Bob LeRose (owner) has also put together the awesome Blues, Views, & BBQ Festival in Westport, CT and will have food there, too. We’ll definitely be back because I need to win that damn t-shirt and must prove myself again. Just like when A la Diabla bested me at Pancho’s, I came back and I defeated that spicy beast. Bobby Q’s, I’m coming back…and coming back with an empty stomach. Gotta convince the wife that we need to eat more BBQ! next step – cook your own! 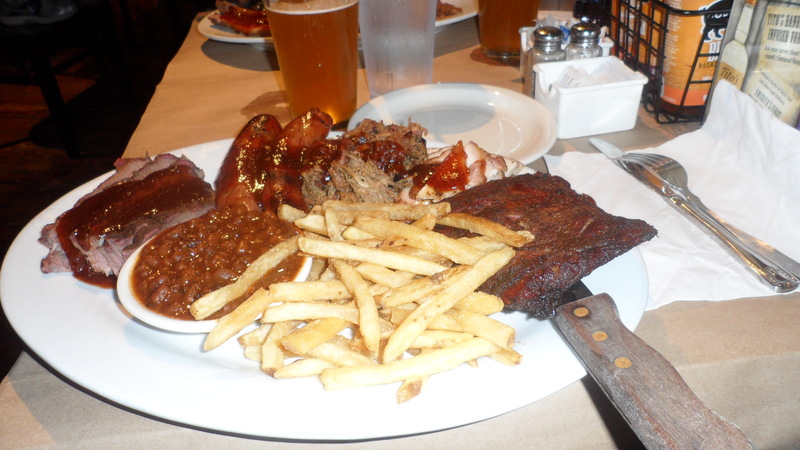 Ah BBQ – My make or break deal with BBQ is Brisket – I do it okay( maybe as good as Smokey Joes. but not better and this tells you what my standards are) so truely the only places i can get better is South! If someone can not make my mouth drool with their brisket, i won’t be back. You seem to have caught on to a gem in Port Chester (it figures)! I will go there and check it out! Brisket isn’t easy to cook or do right. Takes lots and lots of love :) You love your brisket it seems. ;) I’ve never tried to make it myself, but I’m sure it’s hard as hell. 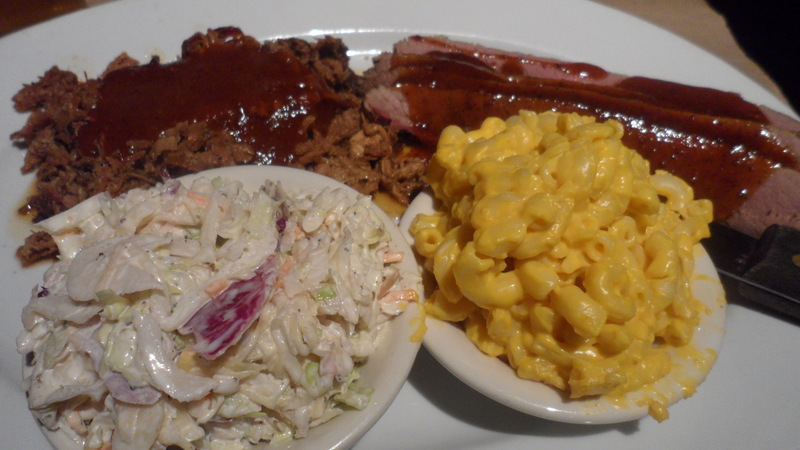 Bobby Q’s has great brisket and so does Q. Q is definitely worth checking out, too, no doubt. :) It’s an interesting vibe in there. It’s like a fancy diner with numbers on tables. Well, you’ll see what I mean. Fresh seafood bar and good beer selection. Love and time, lots of time. The wood and the rub are as important and yes, i have burned some…you can ckeck out my own disclaimer on my blog, i am only a cook, not a chef!